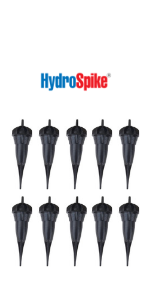 HydroSpike® ClaySpike TM gives you the perfect amount of watering effortlessly each time. Water by hydro filtering with ClaySpike. 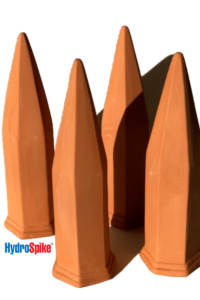 These high quality spikes are made with terracotta and fits most popular glass wine bottles. Use the ClaySpike without a bottle as well, with more frequent water refill. Timed and slow water seepage through spike into the soil promotes healthy root growth. Through ClaySpike, preserve all valuable nutrients in the soil that would otherwise be washed away with conventional water can or wand hose watering. Use as plant food spikes and no need for a plant moisture meter indoor. 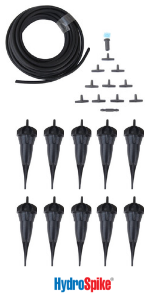 ClaySpike is an excellent garden irrigation system kit, and alternative to garden or plant watering can. Water therapy for your plants. 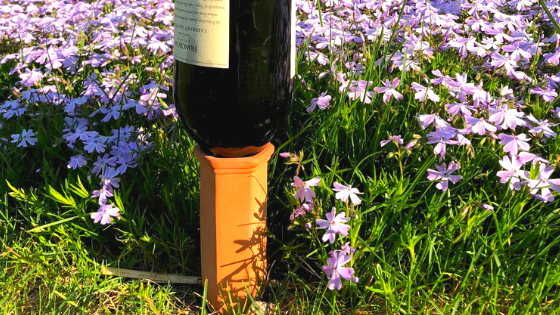 Use with any wine bottle or large long neck glass bottle. No need for electricity, battery, or hose. Portable, flexible and can be filled with water or mixture of plant food or fertilizer. No need for plant rack, stand or attachment. Larger capacity than plant watering globes. For larger container plants or pots. Great as an outdoor garden gifts accessory. Add garden décor or flag with more fancy looking bottles. Looking for an effortless full garden drip system? 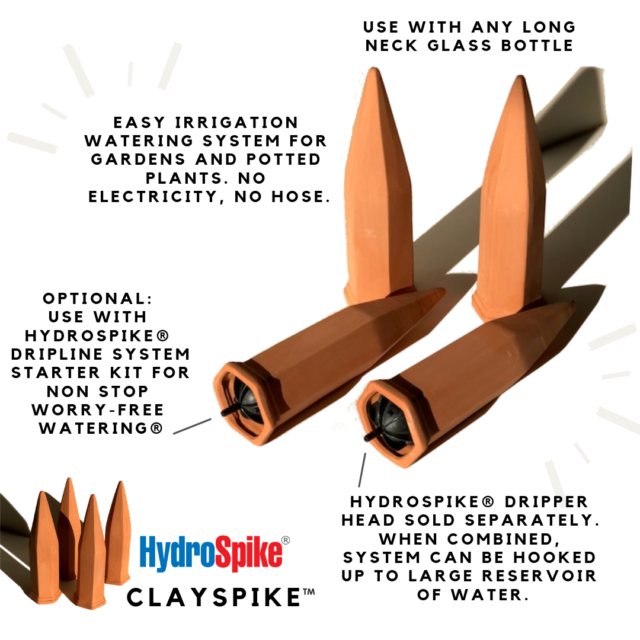 Do it with ClaySpike + HydroSpike Dripline Starter Kit as shown in picture above. Ideal for patio, outdoor and indoor use, especially for vacations. 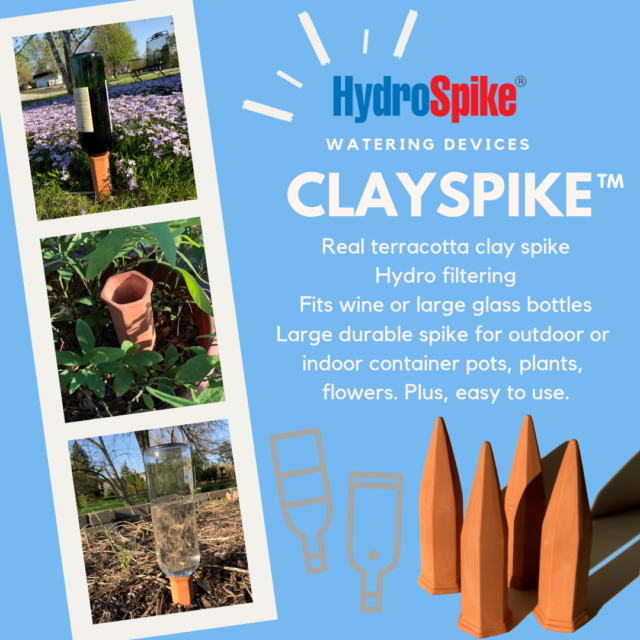 HydroSpike® ClaySpike always provides Worry-Free Watering®. Enjoy vacation while your plants stay hydrated and moist. No need to find a nanny for your plant or plants while you are on vacation because ClaySpike does the work for you, automatic and effortless.